First off folks, remember that all our photographs are copyright 2001 the Monorail Society unless noted otherwise. Now friends, enjoy the view! 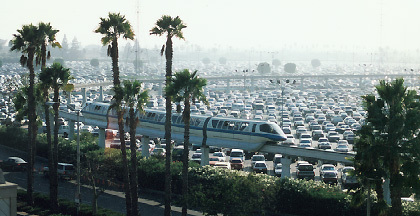 Here we see Monorail Blue about to cross the Disneyland parking lot in October of 1996. It was a familiar sight for park visitors from when the system was expanded from the park to the Disneyland Hotel in 1961 to the late 1990's. In early 2001, the former parking lot opened as a new theme park, Disney's California Adventure. This view is taken from a new Ferris Wheel inside the park looking towards a familiar landmark, the Magic Kingdom's Matterhorn Mountain. What is new here is the view and what you see in the foreground. To the left is the brand new Grand Californian Hotel, which borders the new park. You can see the monorail track crossing the new park and in front of a spectacular new attraction, California Soarin'. While the surroundings are new, the track is still vintage 1961. 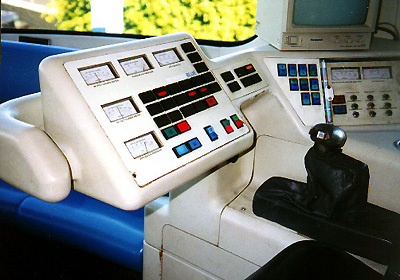 I took this shot of Monorail Blue's controls shortly before the trains were refurbished and outfitted with new equipment. During construction, half of the guideway was shut down for construction of California Adventure. During this period, trains shuttled back and forth on the other half of the loop. Since there are only driver controls at one end of Mark V's, unlike Walt Disney World Mark VI's, monorail pilots drove backwards on one leg with the aid of a tail-mounted camera and television monitor (seen at upper right). Here you have the new revised driver's equipment. Note the joystick controller as well as a touch-screen monitor of systems are new. The entrance to the new California Adventure park features a fanciful re-creation of the Golden Gate Bridge. Funny enough, there have been several proposals to run monorail over the real Golden Gate, but politicians haven't figured out what a good idea that is yet. Will they ever? In the Condor Flat's area of the park, a tribute to the aviation history of California, the track crosses over this vintage Cessna as it heads for the Grand Californian. In the distance you can see Monorail Purple entering one of two tunnels through the hotel. Between the tunnels is a beautiful courtyard. Head for Page 2 and let's have a look!